This is my frog, named Webster. As you can see from the picture, he is quite a handsome fellow and was nice enough to allow us to take his picture on his motion sensor frog which warns us of any intruders. Not to worry however. 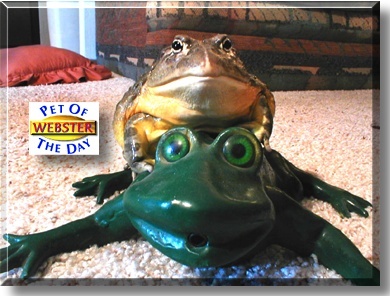 Should there ever be an unwanted guest, Webster is an attack frog so we know we are safe with him around. He is an African Burrowing bullfrog, better known as a Pixie frog. Webster resides both in NM and AZ although he is not very fond of traveling.